Early winter in the Canadian archipelago? Temperatures around zero with snow showers expected the next days for places like Mould Bay and Resolute. There should be accumulation at higher altitudes. Are the anomalies really absurd? Its 6 days to summer solstice and Siberia does get hot in summer. I think its normal to have heat waves and periods of above and well above temperature in parts of Siberia. Western Russia is currently well below average. In a few weeks the pattern can change again. There is currently 31C and sunny in Churchill. Whatever ice is left there is currently cooked and torched. Arctic sea ice / Re: meaningless freezingseason/melting season chatter. Apparently there is still good snow cover in Newfoundland and large parts of Quebec. Hard to imagine considering its end of May and their latitude (same as Paris for example). Major torch for southern Hudson Bay in extended forecast. Far out but 30C possible to destroy the ice. Isn't the Hudson Bay still 100% frozen over? How can the extend then vary at this time of the year? Shouldn't it be a straight line (full cover) until the first open water appears? Active melt has begun and there are large areas of both open water and extensive fracturing. Image from Wordview on the 21st, which of recent days had the best visibility. Thank you. That was quite surprising for me considering the temperatures and the typical resilience of sea ice. There have been really only a handful of warm (>+10C) days so far and nights are still quite frosty. Maybe those holes have something to do with the mud volcanoes in the Beaufort Sea? Does Miami have flood maps? In Australia those flood maps have quite an impact on houses prices already. Open water now visible at Nome, Alaska. Spring has arrived with full force. Well, why didn't ya tell us earlier, Mr Jäger! Damn those asteroid deniers! They won’t take any action until they are 100% sure it will hit, and be bad. I always found the disaster movies where we send up rockets to blow up approaching asteroids laughable. We could shoot a more accurate movie but it would be pretty boring. Scene 1: Announce to the world we're going to all be killed by an asteroid in less than 24 hours. Scene 2: Everyone running around hysterically. Scene 3: We all die. Don't think that would be a boring movie at all. Would provide some fresh air to the genre. Wouldn't the Amoc slowdown effects kick in way before the Earth warms at 4-5C? 4-5C is allot and I think we will have much more serious problems than AMOC slowdown by then. Regarding polar bear numbers, I found this interesting article in NewScientist. Its a bit old so there should be an update by now. Basically, we don't really know for sure how the overall population changes. So more research is required before saying the one or the other. However, the ones that are declining seem to be negatively affected by declining sea ice. And the ones that are increasing seem to recover from previous hunting pressure. Yet recently there have been claims that polar bear populations are increasing. So what’s going on? There are thought to be between 20,000 and 25,000 polar bears in 19 population groups around the Arctic. While polar bear numbers are increasing in two of these populations, two others are definitely in decline. We don’t really know how the rest of the populations are faring, so the truth is that no one can say for sure how overall numbers are changing. The two populations that are increasing, both in north-eastern Canada, were severely reduced by hunting in the past and are recovering thanks to the protection they and their prey now enjoy. The best-studied population, in Canada’s western Hudson Bay, fell by 22% from 1194 animals in 1987 to 935 in 2004, according to the US Fish and Wildlife Service. A second group in the Beaufort Sea, off Alaska’s north coast, is now experiencing the same pattern of reduced adult weights and cub survival as the Hudson Bay group. A comprehensive review (pdf) by the US Fish and Wildlife Service concluded that shrinking sea ice is the primary cause for the decline seen in these populations, and it recently proposed listing polar bears as threatened (pdf) under the Endangered Species Act. The World Conservation Union projects the bears’ numbers will drop by 30% by 2050 (pdf) due to continued loss of Arctic sea ice. 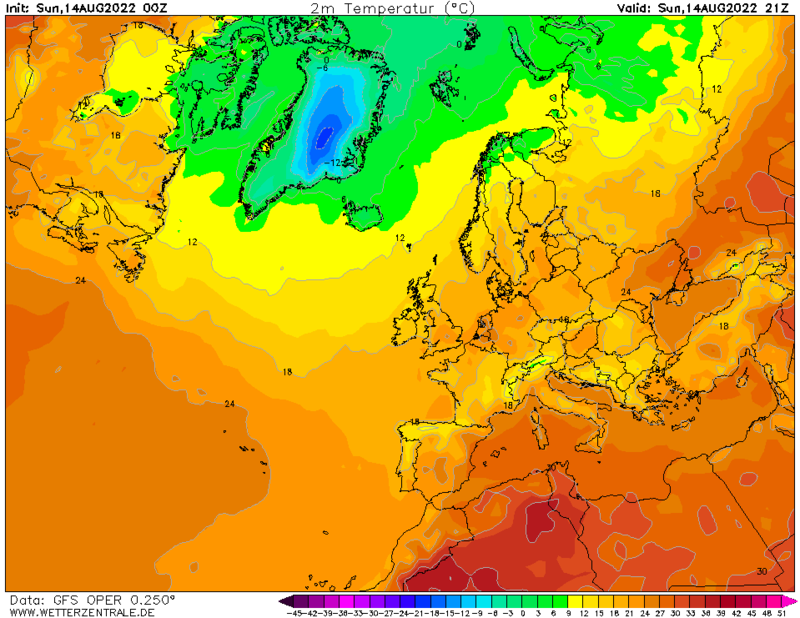 Germany gets endless sunshine at 25C next week. Not that this hasn't happened before and 30C days are not unheard of, but this year it basically went from March winter to April summer. Can't really tell how this relates to climate change and sea ice, but it certainly feels "not normal". Since the turn of the century, the coolest summers have been 2014, 17, and 13, which showed in higher ice minima. AGW denier daniel likes to hide behind the solar TSI, which has been languid for half a century, & low for 11+ years(including a 3+ year solar TSI low setting a 100 year record). With the 24 hours of sunlight(yet low TSI) on the High Arctic, sure there are cool summers. AGW denier daniel doesn't mention low TSI, which if not for AGW GHG energy increases, could have lead to a continuous decade of low High Arctic summer temperatures. Can you please explain what you mean? The weak sun is responsible for colder arctic summers? My assumptions justifying thinking the gulf stream will find its way into the arctic ocean. 1. A BOE will let the stratification of the arctic ocean be disrupted by wave action. 2. when the sun sets and things cool off with the stratification a thing of the past you get bottom water production rather than ice. 3. what drives the currents around Greenland and the CAA currently is the Earth's rotation the warmth coming up from the equator (gulf stream) and the large freshwater input from ice melt and run off. 4. it is the cold reduced salinity run off water plus ocean water surface water current that pushes the gulf stream away from the east coat of north America. The freshwater mixes with surface water, if that becomes bottom water then the surface water needs to be replaced. The cold water would sink rather than stay on the surface. So instead of a current coming out of the arctic ocean past Greenland you would have a current going in instead. No current pushing the gulf stream east. So it would go north into the arctic ocean. With 20C water coming into the arctic basin you could see 20C air temps over the water and storms like there was no tomorrow. Where would you get those 20C waters from? We hardly ever reach 20C in the North Sea even during those exceptionally hot and sunny summers we had in the 90s. And that's like 2000km south of what is considered arctic ocean. I was hoping someone would come along and flatten this distraction at least in the ASIF- a sunspot in a teacup. That website does seem to have something of an 'Agenda'. One could go as far as saying it appears to be a FAKE NEWS outlet. Most website do have something of an 'Agenda.' Unbiased reporting seems to have gone by the wayside. Probably best to read many differing views to arrive at the best summary. If it was only websites. But agenda and bias seems to be creeping into primary scientific research as well. No good times for science IMO. And the joke we call peer review needs a major overhaul. Best is to only "believe" science of people you know and can trust. Talking to them at conferences an ask revealing questions is one way to go. The thing is we will now have a myriad of deniers pointing to the remarkable event of DMI 80 N hitting average!! Are things so whacked out that 'average' is the new remarkable! Average compared to 1950 to 2000. We don't have that climate anymore. So yes, its remarkable. Haven't seen this for a long time. Below average temps across the arctic ocean. 1979- 2000 Baseline... Still waaaaay warmer than 1750 pre- industrial (ca + 0,8- 1,4C). Really hope we won't go back to 1750 baseline. Nobody really needs that in northern hemisphere. That was little ice age in Europe. That is not his point. The map suggests that temps are just barely below average when compared to a 1979-2000 baseline which means they are actually well above recent historical average. Don't worry about ever going back to 1750 baseline in the next thousand years. Almost everything will be above average compared to the 1750 baseline. That was one of the coldest periods in the last 5000 years. Using it as a baseline is extremely misleading. Biggest threat to humanity is still an asteroid impact or super volcano with collapse of agriculture. Is there a reason why the Baltic sea is not included in Arctic sea ice while Okhotsk is? Incredible. Arctic descending into chaos. Wonder what the new stable state will be. Monster heatwave melting its ice sheet. sure. Sensationalism at its best. There is hardly any above freezing temps even along the coast. First sea ice forming in Barrow? It is certainly a mistake to look at climate change in a vacuum, but just because there are many problems/stresses (e.g. over-population, resource depletion, pollution, warfare, systemic fragilities etc.) in the world today, doesn't that climate change won't be the 'straw that broke the camel's back'. Possibly. However, I think that any of those other causes could accomplish the decline (and eventually extinction) all by themselves. That climate change will be a minor contributor to extinctions. Most plants and animals would be able to adapt to climate perturbations much easier that overhunting, pollution, or total habitat destruction. That's what I think too. No matter where I go, habitats are degraded not because of climate change but because of mechanical and chemical destruction through agriculture. Then add expanding cities and hunting/ fishing and you have the perfect storm for extinctions. Without all the human impact, most species would just migrate in the light of a warming climate. Wonder what the mid to long term effects of those repeated freezing (<-5C or even -10C) wind storms are over open arctic waters. This must mix the water and provide substantial cooling to the water column including deeper layers? Isn't this much more effective than the cooling through a 1m thick ice sheet no matter how cold it is over the ice? OMG what an amazing picture. Had no idea they can come in such numbers. First thought those are sheep. At Freyer glacier (1000m above sea level) in northeast Greenland it is currently raining/wet snow at +1.8C. Will probably turn to snow again at night but anyway. Think we have to learn that the downward trend of the last decade may not be representative of the future. Arctic warmed much faster than average. Is this the law? Maybe arctic will now warm at similar rates as global average or even slower? Just some thoughts. Melt ponds start to freeze over? According to GFS, the freezing season should start next week in parts of the Canadian archipelago. Night temperatures of -10C will be expected around Baffin Island. What is source for -10° temps "around Baffin Island"? Weather forecast for Clyde River, which is at middle of east coast of Baffin, has temps above 0° throughout next nine days, with highs above 10° for some of them. Thanks for the correction and sorry for the confusion. I mean Ellesmere Island not Baffin. Looked mostly at the station Eureka and the GFS 2m temp forecast from GFS. Baffin is indeed very far from freezing conditions at this stage. Sorry again. GFS has backed off now a little but still freezing weather expected from next week. Will be exciting to see the first new ice of the year. Isn't that exactly what it looks like, an iceberg? Is it possible that all the smoke is blocking the sun and so reduces melting in the area? Some of the buoys webcam pictures look extremely dark and gloomy. This is how what we know about Arctic as it is today (and as it was in recent past) is often not applicable when we talk about possibilities of year-round ice-free Arctic ocean. Lots of things will change dramatically, by then. And to be honest, i take pity at my own attempts to imagine how things will look like then; i bet such attempts are very primitive and at best - dramatically incomplete. But i can't help but to try. Because if we don't use even what little knowledge we managed to obtain in order to attempt to imagine the future, then i say there is little point in obtaining knowledge in the 1st place. Right? Thanks for the coherent reply. You make good points. I also believe that the future is unpredictable and that there are many important surprises we cant really include in our predictions (super volcano etc). So I wont exclude the possibility of an ice free arctic. Well of course its possible. Do I believe it will happen? At this stage I have to say no as I think that even an advance of glaciers is more likely than a year around ice free arctic. All it would take is a super volcano eruption or a nuclear winter which I think are possibilities in the longer term. I talk about believes here as I don't think we have enough knowledge or variable to go beyond believes in this regard. It's devastating for the local wildlife. Tundra grows very slowly. I would think it's a normal part of nature there. Someone must have caused the fire. Maybe some locals camping and not being careful enough. Wouldn't call that natural. Fryer glacier frost period started a few days ago. Also visible on the webcam is all the snow that seems to have survived the summer and new snow on the surrounding hills. The webcam is at 870m above sea level.